St Augustine Lodge is one of 37 Lodges, which meet in Freemasons’ Hall, Park Street, Bristol BS1 5NH in the centre of Bristol, on designated evenings. Our Bristol Masonic Lodge meetings are held on the second Thursday of the month and we have a Lodge Committee meeting followed by a rehearsal on the first Thursday (committee meetings commence at 1830hrs, the rehearsal starts at 1900hrs). St Augustine Lodge meets in February, March, April, May, September, October, November and December. St Augustine Lodge meetings commence at 1830hrs and typically end around 2015hrs. Members then gather in elegant dining rooms for dinner, often including Provincial guests and visitors from other Lodges. On special occasions non-Masonic guests also attend. St Augustine Lodge Masonic meetings take a ritualistic form and are designed to ensure that all members are reminded that one has a purpose in life. Masonic tools (e.g. compasses, squares and rulers) are utilised to illustrate the way one should live. In the summer months St Augustine Lodge arrange social occasions (e.g. barge trips, historic house visits, pub lunches and dinners, skittles tournaments and weekends away) to which friends and family are invited. Once each year a Masonic Ladies’ Evening is held in honour of the members’ wives and partners who are invited to dine with St Augustine Lodge. Ladies’ Evening provides the perfect opportunity to thank our wives and partners for the essential support they provide throughout the year. Click through to the St Augustine Lodge events calendar. A myth surrounding Freemasonry is that only the wealthy can join. Whilst there is an annual subscription paid by each member, generally the amount is much less than one would pay to join a golf club or a gym. The Warrant for St Augustine Lodge No. 3108 was granted on 15 April 1905. It was the result of a petition signed by 23 Brethren of the Beaufort Lodge No. 103 in the Province of Bristol seeking to establish the new Lodge. St Augustine Lodge was established as a musical lodge; the name chosen by the Founders due to the neighbourhood of Freemasons’ Hall being closely associated with St Augustine. An Augustinian Priory formerly stood on the site of Bristol Cathedral. The Cathedral (dedicated to the Holy Trinity in 1542), was until 1539 the Abbey Church of the Black Canons of St Augustine. Further, St Augustine of Canterbury is said to have preached on College Green prior to his conference with the Bishops of the early British Church in the late sixth century. St Augustine Lodge was Consecrated on 14 September 1905, when 238 brethren were in attendance. The Ceremony was conducted by W.Bro. JR Bramble the Deputy Provincial Grand Master and W.Bro. J Mason Gutteridge who had been the Master of the Beaufort Lodge and who became the first Master of the new Lodge. 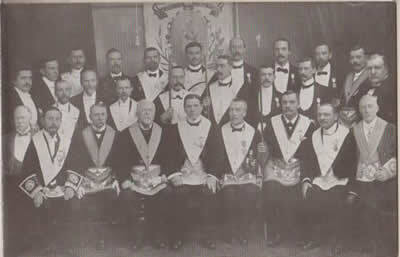 Above: The Founders and Officers presiding over the Consecration of St Augustine Lodge on 14 September 1905. Those present are LG Phillips (Steward), F Warner Waite (J.W. ), H Slater Stone (Steward), F Hayman (Steward), HF Banner (Steward), H Pomeroy (Finance), J Parnell (Steward), W Avery Adams (Steward), AJ Blake (Steward), AF Farbrother (Secretary), E Brookhouse Richards (S.D. ), E Liddon Miller (I.G. ), F Gunningham (J.D. ), WT Rugman (Acting I.P.M. and Treasurer), HEC Baker (Steward), WT Toleman (Steward), HE Padden (Tyler), E Spear (D.C.), AH Jupp (Steward), FJ Brooks (Steward), FC Fawn (S.W. ), A Stear (Steward), W Redwood (Finance), J Mason Gutteridge (WM). Provincial Grand Lodge Officers JR Bramble (P.A.G.D.C.) (Eng.) Deputy Provincial Grand Master, WJ Cullimore (P.P.S.G.W.) as D.C., P Harris (P.A.G.D.C.) (Eng.) Provincial Grand Secretary as Secretary. The occasion was marked by the presentation of a Founders Jewel to each Founder Member. 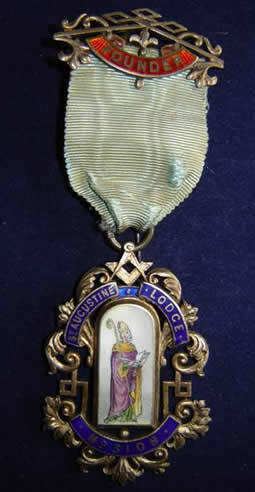 Above: The Founders Jewel featured was that presented to W.Bro. Stear in 1905. Regrettably, the St Augustine Lodge records are incomplete. The two earliest minute books and consequent early history of the Lodge are missing. So are numerous Lodge artifacts from those primary years. It is believed that the Minute books and artifacts were destroyed during the Blitz in 1940, which destroyed the former Masonic Hall in Park Street. The first record therefore dates from the 256th Regular Meeting, which was held on 11 January 1934. The Lodge ‘Register of Members’ is intact and complete. The Lodge therefore has a complete record of its membership since Consecration. These records were likely in the possession of the St Augustine Lodge Secretary (and stored elsewhere) at the time of the Blitz, thus being saved from the wartime destruction. At the Meeting held on 13t December 1945, the acting W.M. W.Bro. GT Ryan announced that to commemorate the 40th Birthday of St Augustine Lodge, the 25th Anniversary of his Initiation into St Augustine Lodge and his period of Office as Worshipful Master, W.Bro Ryan would present a Silver Trowel for use in one of our ceremonies. 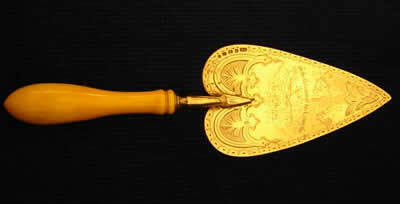 The trowel had originally been presented to his grandfather, a vicar in Bradford (Yorkshire), who had been the first Bishop of Mauritius (after laying the foundation stone for an orphanage in Bradford). The engraved trowel is a treasured artifact and kept with the working tools of the Lodge. (front) Presented to The Right Reverend Bishop Ryan on the occasion of his laying the foundation stone of the Bradford orphanage July 5 1870. (back) Presented to St Augustine Lodge No. 3108 by GT Ryan W.M. 1944 – 45. On 13 May 1948, the Deputy Provincial Grand Master W.Bro. WW Jervis expressed his pleasure in handing to the W.M. the confirmation of the Lodge Charter Warrant, which had been issued by Grand Lodge to replace the original Warrant lost in the destruction of the Masonic Hall, Park Street, Bristol during the Blitz of 1940. The minute books for St Augustine Lodge record the close association formed during World War II with the Brethren of St Augustine Lodge No. 99 in New Zealand (e.g. 13 March 1947 sale of the contents of the third gift parcel from the Brethren of St Augustine Lodge No. 99, which was auctioned and realised £4. 7s. 6d. in aid of local Masonic charities). Subsequently, a Gavel wrought from timber salvaged from the ruins of St Augustine Lodge Masonic building in Bristol, together with a level from the remains of an apron also recovered in the ruins were mounted on a base. This was suitably engraved and together with a copy of a book ‘Bristol Bombed’ was sent to the W.M. and Brethren of St Augustine Lodge, Christchurch, New Zealand, as tokens of gratitude for the many gift parcels sent during the War years. Like the other Lodges in the Province of Bristol, the St Augustine Lodge played its part in assisting the efforts to rebuild the Masonic Hall in Park Street. At Regular meetings during 1954 the Brethren of the Lodge donated sums of money to provide further accommodation required by the Province of Bristol. The St Augustine records indicate that that providing sufficient funds were available, the Park Street Masonic Hall would be rebuilt. Initially the sum of £150 13s 7d was contributed and subsequently sums of £200 and £149 6s 5d; substantial sums at that time. Hawthorns Hotel BS8 (11 September 1947 – 14th May 1953). Masonic Hall, Brunswick Square BS2 (11 September 1954 – May 1957). St Augustine Lodge celebrated its centenary on 13 October 2005. On the occasion, St Augustine Lodge was honoured with the presence of the Provincial Grand Master for Bristol R.W.Bro. MJ Flynn and the Deputy Provincial Grand Master of Bristol V.W.Bro. AJ Vaughan together. During the proceedings, the Provincial Grand Master presented to the W.M. the Centenary Warrant and a Centenary Jewel to each member of St Augustine Lodge. Above: The St Augustine Centenary Jewel.